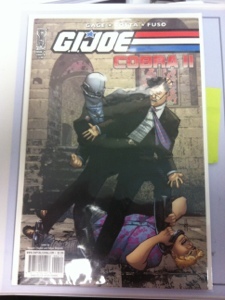 Just finished reading GI Joe Cobra II #4. I really enjoyed the fight scene panels with Chuckles and the Cobra Vipers. I especially liked that they didn’t have text. It was also good to know who Jinx’s look a like is now, Chameleon. Can’t wait till issue 10 when try pick up Chuckles storyline again and I find out what Cobra Commander has in store for him. Also I’m enjoying the adult twist with characters dying. Makes it more believable.